This is a maternity cover position initially on a fixed term contract of 9 months but our ambitious growth plans mean that long term there are likely to be other opportunities for the right person. Reporting directly to the Chief Executive the post holder will be responsible for the development, implementation and evaluation of Share Discovery Village’s Sales & Marketing Strategy and will provide support in all areas of marketing, advertising and events management. Closing date for applications is 12 noon Tuesday 12th March 2019. We are looking forward to a busy 2019 season, and are seeking a Full time & Part-time Assistant Cook / Chef for the coming summer season. Normal catering shifts are from 7.00 am – 3.00 pm and 10.30 am – 6.30 pm although there are times when earlier or later shift hours are required. If interested in applying for the position please send us your application form at your earliest convenience. 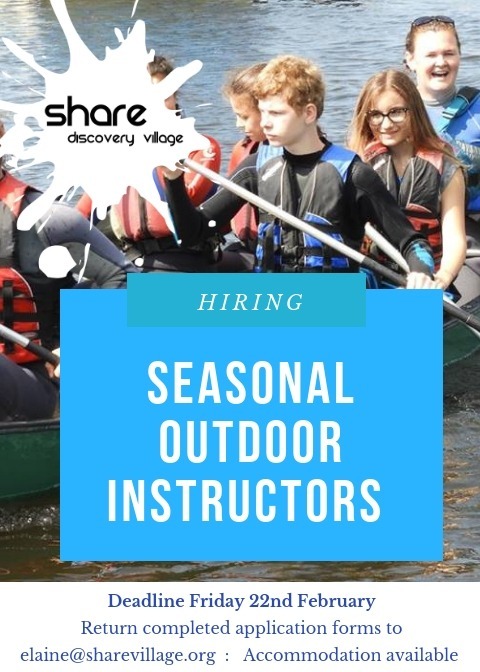 We are looking forward to a busy 2019 season, and are seeking enthusiastic, out-going, hardworking outdoor instructors for the coming summer season.